Rubén Sobrino is a name most Manchester City fans will not be familiar with, but he is technically a City player, having joined from Ponferradina in 2015. His arrival was followed by an immediate loan to Girona, a Spanish second tier club working closely with City, largely because agent Pere Guardiola, brother of Pep, has a large stake in them – and promotion to La Liga would give City a new option to loan high-quality young players to. 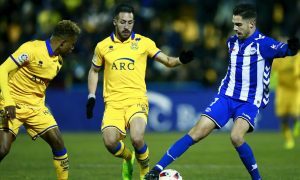 Sobrino made a good enough impression on loan at Girona to attract significant interest, even from Premier League side Stoke, but City decided not to sell him and moved him up a division, loaning the 24-year-old to La Liga outfit Alavés. It is safe to say, Sobrino’s move to Alavés has not been a success so far. He has made four appearances in the Copa del Rey, scoring his first goal before Christmas against Gimnàstic. 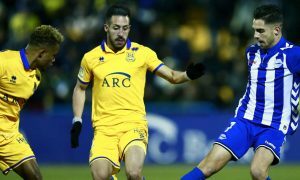 In La Liga, however, Sobrino has only made the matchday squad four times this campaign, playing just 13 minutes until the weekend. The tide may be turning for the former Real Madrid youngster, though, as he featured for 80 minutes against Sporting Gijón on Sunday and scored his first goal in Spain’s top flight. And according to Marca, Manchester City still believe Sobrino has plenty of improvement in him. The Spanish newspaper reports today that Sobrino’s parent club are ‘very confident’ that he will grow into a high-quality player. In both games he scored in this season, Sobrino was given the MVP award, and is said to be happy at the Mendizorrotza, working hard to earn more chances in the team. Realistically, his chances of having a future at City are slim, but like with Florian Lejeune, another obscure buy from the Spanish second tier, City may be able to make a considerable profit on the £200,000 they paid for Sobrino a couple of years ago.